Bihar Prashasnik Sudhar Mission Society (BPSM Bihar) has released BPSM Bihar Recruitment Notification-2018 for the post of 1233 vacancies for the posts of Executive Assistant. The Recruitment has complete details about their notification on its official website i.e., bpsm.bih.nic.in and www.careers99.com. 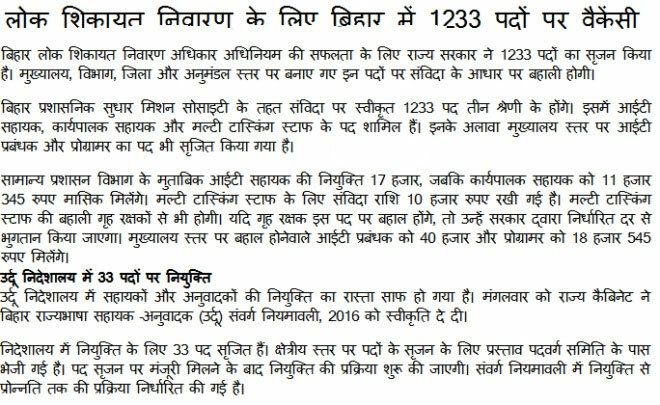 This is a good news for those who are waiting for Bihar Govt Jobs. Candidates may apply offline before the Last date of the Notification i.e., Updating Soon.And the remaining details for the recruitment like Educational Qualifications, Eligibility criteria, Age limit, No of vacancies, Post names, Pay scale, Job location, Application fee, Important links, Procedure to Apply are mentioned below. Pay Scale Rs.11,345/- for Executive Assistant. Pay Scale Rs.10,000/- for Multi Tasking Staff. Pay Scale Rs.17,000/- for IT Assistant. Pay Scale Rs.40,000 for IT Manager. Pay Scale Rs.18,545 for Programmer. 1. Open Official Website i.e., bpsm.bih.nic.in or Below Mentioned link from www.careers99.com Website.